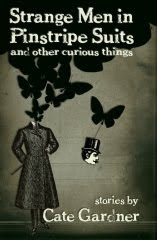 Strange Publications is proud to announce the forthcoming publication of Strange Men in Pinstripe Suits and Other Curious Things by Liverpool's own Cate Gardner. Strange Men is a collection of twenty-four previously published and original short stories, each told in Gardner's sumptuously surreal, deliciously deviant style. Her work has recently appeared in Fantasy Magazine, PostScripts, and Necrotic Tissue among other venues. She is also a regular contributor to Strange Publications' own 52 Stitches. Read more about Cate at her blog and follow her work at http://www.categardner.com/. Congrats, Cate. Can't wait to get a copy. ...publisher of horror and weird fiction. Please feel free to browse, and contact us with any ideas or questions. We are ready to hear from you.